and the time to be there is August 4-7, 2019. 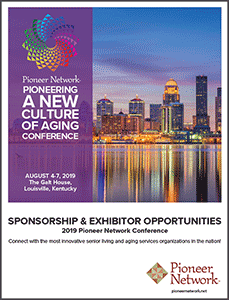 What better place to come together to advocate for and facilitate deep system change in the culture of aging than at the 2019 Pioneering a New Culture of Aging Conference in Louisville, Kentucky on August 4 – 7. The theme this year is “Making it Happen” — and that’s just what we plan to do. We have lots of great guides lined up to explore with you what is happening today — and share ideas for making even better things happen in the future. YOU are Pioneer Network; we can’t do it without you! Networking makes the Pioneer Network conference a go-to event for so many. We p romise there will be lots of opportunities for networking — reconnecting with old friends and making new ones. Watch for updates here on our website as well as in the weekly Pioneer Network newsletter and most importantly, mark your calendar for August 4 – 7. Click here to view our 2019 prospectus. Watch this wonderful video of Carter Catlett Williams, convening the 2018 conference. It is a dose of culture change inspiration through Carter’s magnificent voice, heart and images. Show it to others and hand out Pioneer Network’s Values and Principles Card (pdf) and then discuss together what you are inspired to do in the days to come. Copyright Wendy Lustbader 2018. Used with permission. This video may be shared freely.